Join us on Saturday, April 20, 2019 at 7 pm at The District in Sioux Falls. It’s free admission. We’ll have a live band, cash bar and dessert bar, a program at 8 pm with a Habitat homeowner who just moved in to her new house, silent auction of about 80 upcycled works of art and furniture, and live art performances! We are excited to offer online bidding this year! View the collection and REGISTER to bid here. Please note, we are not able to ship items. Please plan to either attend the event or pick up your winnings from our ReStore the following week. The collection above includes all of our silent auction items, which are available for online bidding until 9:30 Saturday night. The live art performance pieces will be available at the live auction during the event. We have the pleasure of working with a number of sponsors who wanted to invest in our art auction, this year! Feeling the excitement other companies have for our event is moving. A special thank you to TSP and First National Bank, as our Presenting Co-sponsors. Howalt+McDowell Insurance is our Entertainment Sponsor. 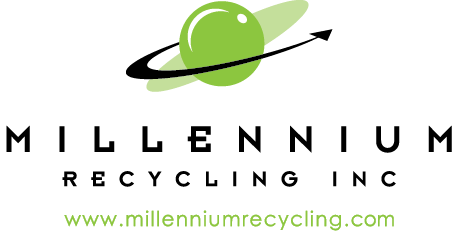 And Millennium Recycling is excited to partner with us as the Community Sponsor. It would have been difficult to reach our goal of topping $60,000 this year without their support. We are forever grateful. Between our sponsors, the amazing upcycled art being created, the homeowner story Maaza is going to share, and the live art performances we’re planning, it’s going to be a phenomenal year! Lifting up environmental efforts is very important to us. That is why we host our art auction around Earth Day. We are excited to say that 679 donated ReStore items have been upcycled into 329 works of art and furniture in the past five years! 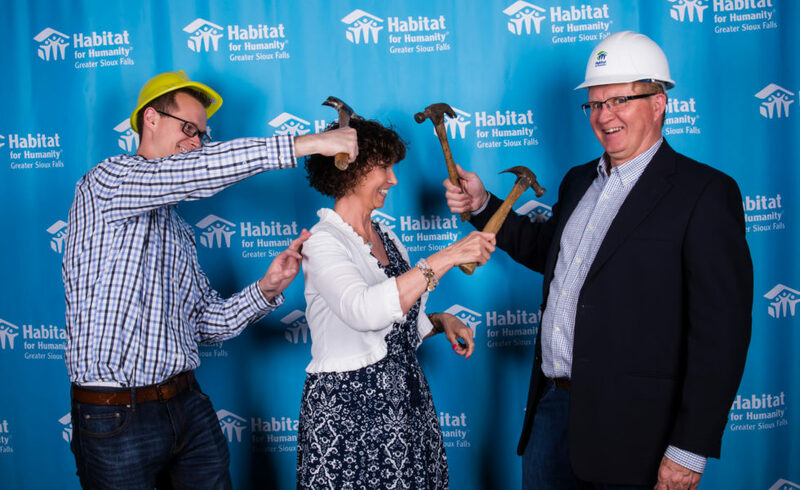 We aim to raise awareness about Habitat for Humanity’s ministry; spotlight the value of recycling / upcycling / repurposing and the environmental impact thereof; and serve as a fundraiser for Habitat Sioux Falls. Keloland Living invited us to talk about our sixth annual upcycled art auction. In-depth interview with Lori Walsh on In the Moment on SD Public Broadcasting was a dream come true. Several AIA South Dakota (American Institute of Architects) Emerging Professionals stretched their skills and created upcycled works. The group’s leader, Allison Dvorak, wrote about it for Blueprint South Dakota. KSFY Morning Show spotlighted one of our artists, Mikey Martinez, and we got to talk about the art auction throughout the show! Our fifth art auction raised $13,281 with 104 pieces of upcycled art. Our Earth Day celebration was at The District, a beautiful setting for our fun night out with Habitat. Here are pictures of the event, hosted on April 21, 2018. We had a fun photo booth this year. Here’s the collection of one of a kind art and furniture sold at the auction. This was our fourth annual art auction. We raised $13,695, sold 93 works of art and furniture, repurposed 192 ReStore items, and entertained 300 guests on Earth Day weekend! That’s double the art submissions from 2016! Here are the pictures of the gathering, hosted on April 22, 2017. Here’s the collection of upcycled art and furniture sold at the auction. 2016 was our third annual art auction. We raised $6,019, sold 48 works of art and furniture, repurposed 101 ReStore items, and entertained 250 guests on Earth Day weekend! Here are the pictures of the event, hosted on Saturday, April 16, 2016. 2015 was our second annual ReStorAtion Art Auction. We raised $4,685, sold 36 works of art and furniture, repurposed 56 ReStore items, and entertained 225 guests on Earth Day weekend! Here are the pictures of the event, hosted Saturday, April 18, 2015. 2014 was the first year we hosted the ReStorAtion Art Auction. The special event was featured Earth Day weekend. We raised $7,110, sold 45 works of art and furniture, repurposed 86 ReStore items, and entertained 250 guests! Here are pictures of the event, hosted Saturday, April 19, 2014. We had the privilege of being featured in a documentary! A traveling documentary team from Massachusetts covered our art auction for the SD reuse/repurpose feature. Check out the trailer. Sioux Falls Woman – the article is on pages 18-19 in the February-March issue. Etc. For Her – the article is on pages 68-71 in the January issue. If you have questions, or can envision partnering on our special event, please contact Niki Schillerstrom, Community Relations Director, via email or 605-274-6291. The Sioux Falls ReStore keeps over 475 tons of building material out of the local landfill each year! That equals 68 adult elephants. Imagine that! Donations of new, gently used, and antique home building and home goods by individuals, contractors and corporations amounts to 68 elephants. Those items include picture frames and pictures, doors, light fixtures galore, tile and glass. The imagination runs wild thinking about what artists will design for their ReStorAtion Art Auction original. These items have found a second life at the ReStore. Learn more about our ReStore here. Would you like to receive the ReStore Early Bird email? It’s an email that we send daily with a picture and some info about the best deals and most unique items found at the ReStore. They might provide the perfect inspiration for your art piece, give you an idea of what the ReStore stocks, or even help you invest in the community in another way. Click here to sign-up.